Due to the still increasing penetration of grid connected Photovoltaic (PV) systems, advanced active power control functionalities have been introduced in grid regulations. A power reserve control, where namely the active power from the PV panels is reserved during operation, is required for grid support. 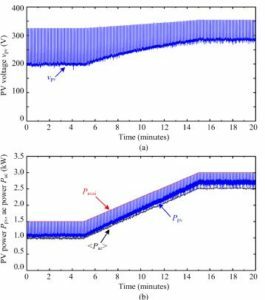 In this paper, a cost-effective solution to realize the power reserve for two-stage grid-connected PV systems is proposed. The proposed solution routinely employs a Maximum Power Point Tracking (MPPT) control to estimate the available PV power and a Constant Power Generation (CPG) control to achieve the power reserve. 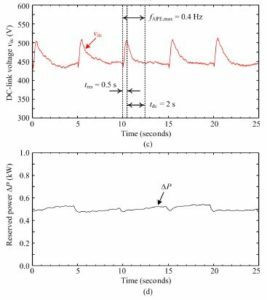 In this method, the solar irradiance and temperature measurements that have been used in conventional power reserve control schemes to estimate the available PV power are not required, and thereby being a sensorless approach with reduced cost. Experimental tests have been performed on a 3-kW two-stage single-phase grid-connected PV system, where the power reserve control is achieved upon demands. Fig.1.System configuration and control structure of a two-stage grid connected PV system with the Sensorless Power Reserve Control strategy. Fig. 2. Experimental results of the single-phase grid-connected PV system with the proposed SPRC strategy during the steady-state operation (solar irradiance level: 1000 W/m2; ambient temperature: 250C; available power estimation rate: fAPE = 0.2 Hz), where the reference power reserve ∆P are 700 W, 500 W, and 300 W: (a) PV voltage vpv, (b) PV power Ppv and ac power (Pac), (c) dc-link voltage vdc, and (d) reserved power ∆P. Fig. 3. 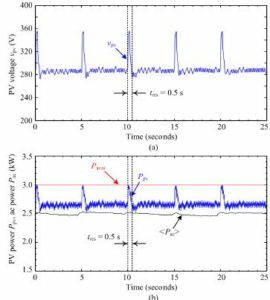 Experimental results of the single-phase grid-connected PV system with the proposed SPRC strategy at the sampling rate of fAPE = 0.05 Hz under a ramp-changing solar irradiance profile (ambient temperature: 250C), where the reference power reserve ∆P is 500 W: (a) PV voltage vpv, (b) PV power Ppv and ac power (Pac), (c) dc-link voltage vdc, and (d) reserved power ∆P. Fig. 4. Experimental results of the single-phase grid-connected PV system with the proposed SPRC strategy at the sampling rate of fAPE = 0.2 Hz under a ramp-changing solar irradiance profile (ambient temperature: 250C), where the reference power reserve ∆P is 500 W: (a) PV voltage vpv, (b) PV power Ppv and ac power (Pac), (c) dc-link voltage vdc, and (d) reserved power ∆P. Fig. 5. Zoomed-in view of the results in Fig. 16: (a) PV voltage vpv, (b) PV power Ppv and ac power (Pac), (c) dc-link voltage vdc, (d) reserved power P.
Fig. 6. 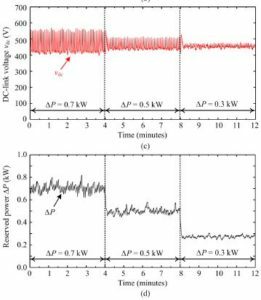 Experimental result of the PV voltage vpv and the dc-link voltage vdc with different available power estimation sampling rates fAPE. 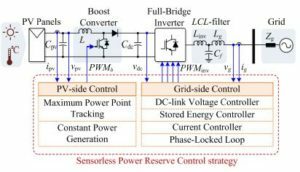 A cost-effective sensorless power reserve control strategy for two-stage grid-connected PV systems has been proposed in this paper. 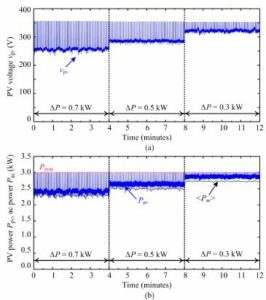 The cost-effectiveness of the proposal lies in the sensorless estimation of the available PV power, which is achieved by routinely employing a fast MPPT operation. 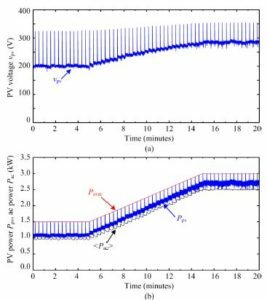 Then, the estimated available power is used for calculating the set-point to limit the extracted PV power with the CPG operation. 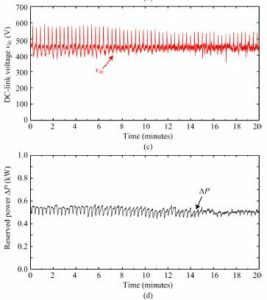 At the grid-side, the stored energy in the dc-link is adaptively controlled to minimize the power fluctuation during the available PV power estimation process, where the excessed energy is temporarily stored in the dc-link. With the above coordinated control strategy, the power reserve control can be achieved as it has been verified experimentally. Design considerations for a high control performance and the operational boundary have also been discussed to assist the practical implementations. REN21, “Renewables 2016: Global Status Report (GRS),” 2016. [Online]. Available: http://www.ren21.net/. Fraunhofer ISE, “Recent Facts about Photovoltaics in Germany,” April 22, 2016. [Online]. Available: http://www.pv-fakten.de/. Solar Power Europe, “Global Market Outlook For Solar Power 2015 – 2019,” 2015. [Online]. Available: http://www.solarpowereurope.org/. 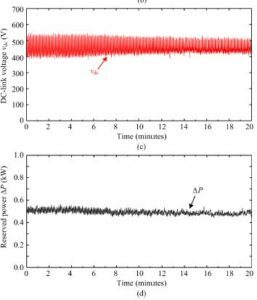 Reiter, K. Ardani, R. Margolis, and R. Edge, “Industry perspectives on advanced inverters for us solar photovoltaic systems: Grid benefits, deployment challenges, and emerging solutions,” National Renewable Energy Laboratory (NREL), Tech. Rep. No. NREL/TP-7A40-65063., 2015. 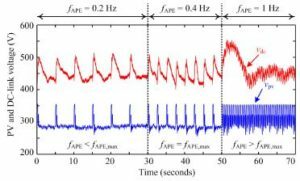 Yang, P. Enjeti, F. Blaabjerg, and H. Wang, “Wide-scale adoption of photovoltaic energy: Grid code modifications are explored in the distribution grid,” IEEE Ind. Appl. Mag., vol. 21, no. 5, pp. 21–31, Sep. 2015..